A woman carries some of her belongings through flood waters following cyclone force winds and heavy rain near the coastal city of Beira, Mozambique, Tuesday March 19, 2019. Torrential rains were expected to continue into Thursday and floodwaters were still rising, according to aid groups trying to get food, water and clothing to desperate survivors. It will be days before Mozambique's inundated plains drain toward the Indian Ocean and even longer before the full scale of the devastation is known. 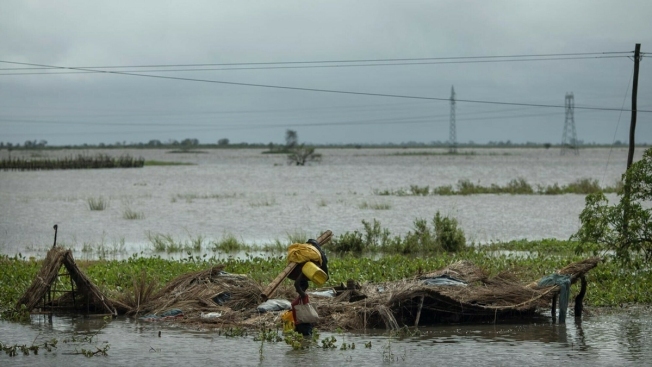 Floodwaters are rushing across the plains of central Mozambique, submerging homes, villages and entire towns. The flooding has created a muddy inland ocean 50 kilometers (31 miles) wide where there used to be farms and villages, giving credence to Mozambican President Filipe Nyusi's estimate that 1,000 people may have been killed. "Yesterday, 910 people were rescued by the humanitarian community," said Caroline Haga of the International Federation of the Red Cross in Beira. She said 210 were rescued by five helicopters and 700 were saved by boats. "We're hoping to rescue as many as we can today as it is not raining," she said. "Rescue activities will continue until everyone is brought to safety." Aid organizations are trying to get food, water and clothing. 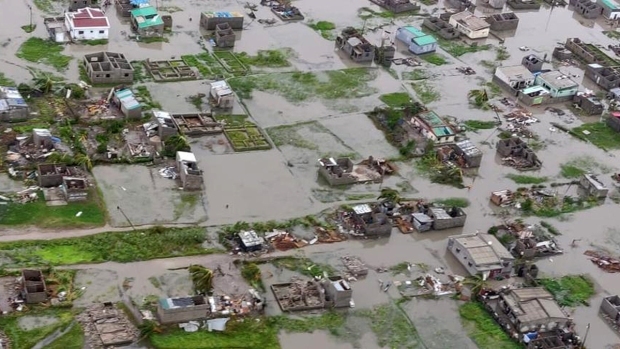 It will be days before Mozambique's inundated plains drain toward the Indian Ocean and even longer before the full scale of the devastation is known. Zimbabwe's eastern mountains have been deluged and the rain is continuing. "I can say I am a bit lucky, my wife and son are still here with me but for everything else, I have to start from scratch," he said. "My bean crop was ready for harvesting before the cyclone, the maize was close. I am back to zero," he said. "It may take a year, maybe even more years just to get back on my feet," he said. Associated Press writer Andrew Meldrum contributed to this report.